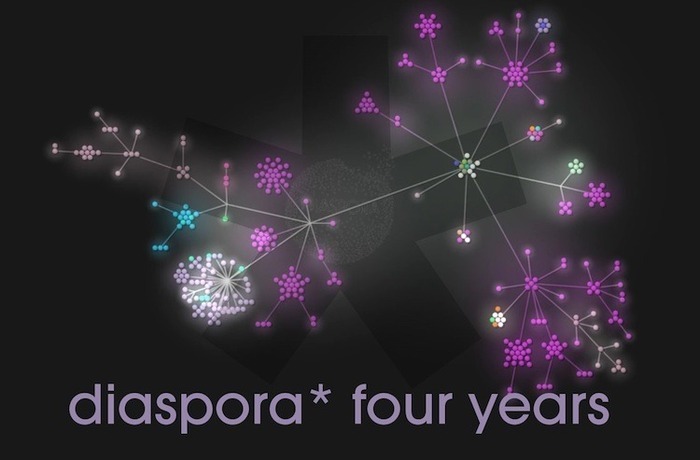 This month, diaspora* celebrates two anniversaries: it's two years since the project was formally handed over from its founders to its community, and four years since the first developer preview of the code which runs the network was released. Since the hand-over in 2012 the community has continued to grow as more and more people look for a new kind of social network, in which you have the freedom to communicate in the ways you want to, and in which you can own your data. We can only estimate the number of individuals using diaspora*, as we explained in a previous blog post, but we can see that this number is growing steadily. In those two years, since when we adopted a semantic versioning system, we have released 4 major versions of the software and 5 minor versions. Many dozens of people from all over the world have contributed to these releases, which have included performance and stability improvements alongside significant new features. The work of porting the interface to the Bootstrap CSS framework is now almost complete. This will make it far easier to streamline and improve the user experience in the future. We are currently testing a new minor release, version 0.4.1.0, which includes a number of performance improvements and bug fixes; and we're working on our next major release, diaspora* version 0.5, which will include major upgrades to Rails (the framework in which diaspora* runs) and Sidekiq (the background jobs processor), which together should provide a significant boost to performance. To celebrate our anniversary, community member Augier has made a video showing the history of development of diaspora*'s software. You can see how it has grown over the past four years! Big thanks to Perturbator for permission to use their music in the video. diaspora* is always growing and always improving. As an open-source project, we're always keen to hear from people who can help us improve the software or who would like to help improve diaspora* in other ways. If you haven't tried diaspora* yet, have a look at our guide to choosing a pod, and come and join us. We look forward to meeting you and hearing your ideas!